Maned Wolf: Species in World Land Trust reserves. The Maned Wolf is one of the largest members of the canine (dog) family in South America, standing at nearly a metre tall at the shoulder. 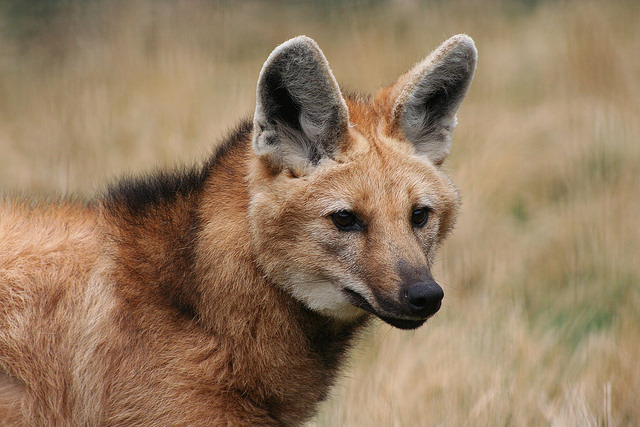 With a body length of up to 75 cm (including tail) the Maned Wolf weighs up to 30 kg. Its appearance is similar to that of the Red Fox (Vulpes vulpes), with a highly recognisable golden-red coat, large ears and white throat. The black mane runs from the back of the head to the shoulders. The Maned Wolf’s long, thin legs are an adaptation that allows the animal to see above tall grass when hunting. Maned Wolves can be nocturnal (most active at night) or crepuscular (most active at dawn and dusk) and rest in dense vegetation during the day. Generally they lead solitary lives, with the male and female coming together to mate. Occasionally mated pairs are seen travelling and resting together. Females usually give birth in an above-ground den sheltered by natural features. A female will have up to three pups, which stay with her for a year. Adults are territorial and use scent marks and faeces to mark their territory boundaries. Their most frequent method of communication is the loud roar-bark used to ward off other individuals. Their diet is highly variable depending on food availability. The Maned Wolf is an omnivore meaning it eats a variety of foods including plants and other animals. Up to 50 per cent of its diet is made up of fruit and the other 50 per cent consists of invertebrates, birds, reptiles and mammals such as rodents and small deer. Maned Wolves inhabit a range of different habitats in South America across Brazil, Bolivia, Peru, Paraguay, Uruguay and Argentina. They mainly live in open grass and scrubland, woodland and wet fields (which flood seasonally). They are also seen hunting on farmland pastures, although they do not prey on livestock. There are thought to be around 23,600 adults left in the wild. Maned Wolves are protected by law in parts of their range, with hunting prohibited in Brazil, Paraguay and Bolivia, although enforcing those laws is often difficult. 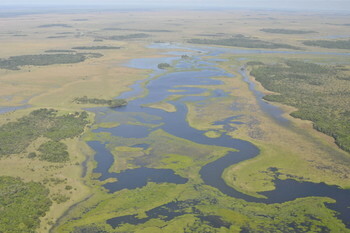 The main threat is habitat loss and fragmentation, as grasslands are converted to farmlands for grazing and growing crops. Road accidents are another threat, particularly to younger individuals. Domestic dogs can cause also problems as they can spread diseases to Maned Wolves, as well as chasing and attacking them.